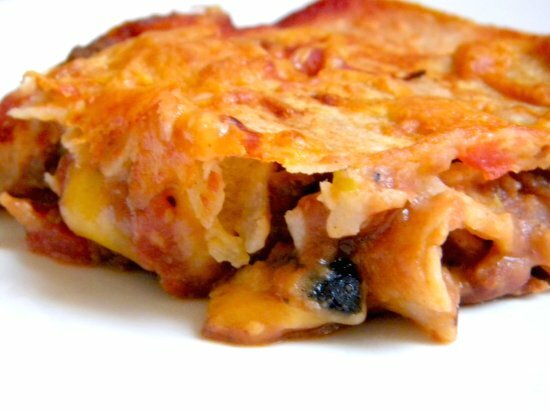 If you love burritos and lots of Mexican flavor this easy, family friendly casserole is one that you will definitely want to add to your recipe box. You can make it to the point of baking ahead of time, refrigerate, and then bake it just before serving or cover it tightly (unbaked) and freeze for a handy freezer meal. It is just as good with less meat, so if you want to cut the (all ready low) cost of this dish just use less beef and more beans. I like it with sour cream and avocado on top but that isn’t necessary. It really is a one dish meal and high in fiber from the corn tortillas, beans, and vegetables. Add a salad or some fruit and you are good to go. Line your casserole dish with aluminum foil, spray it liberally with cooking spray and bake. Let it cool to room temperature and flash freeze. When frozen lift the aluminum foil covered casserole out of the pan and remove the aluminum foil. Put the frozen casserole in a vacuum sealer and seal according to manufacturer’s directions. It takes up less room in the freezer this way and frees up your pan. When you want to thaw it for baking just place the frozen casserole back in the same pan, cover tightly and refrigerate overnight. How cool is that? I adapted this from a Allrecipes. A fast, hearty Mexican meal that the whole family will love. 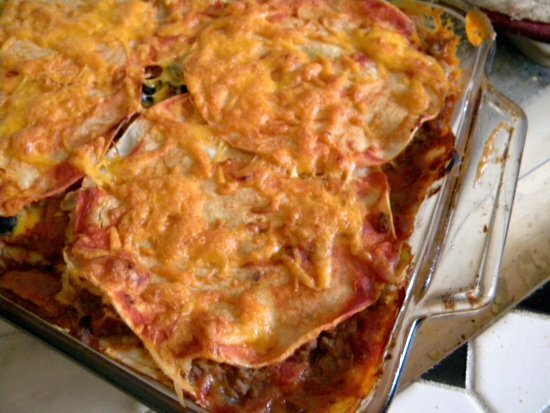 This casserole goes together fast - double the recipe and freeze the extra one for another day. Saute the ground beef for 5 minutes in a large skillet. Add the onion and saute for 5 more minutes. Sprinkle with taco seasoning and add 1/2 cup water. Mix in the olives, green chile peppers, cumin, Rotel, taco sauce (except the reserved (1/2 cup),refried beans and 1 cup of the cheese . Stir mixture thoroughly, reduce heat to low, and let simmer for 10 minutes, stirring occasionally. Spread a thin layer of the meat mixture in the bottom of an oiled 13x9 inch dish. Repeat the layers ending with tortillas. Cover the tortillas on the top with reserved taco sauce and remaining cheese. Bake for 20 minutes, or until cheese is bubbly and casserole is heated throughout. Let set for 5 minutes or so before serving.